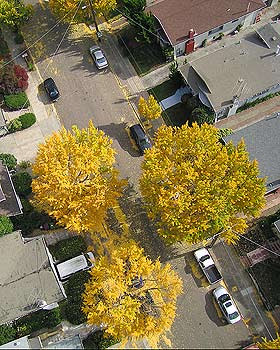 Great photo by Michael L of Ginkgo trees in Berkeley, California. * New photo photospecial page: Ginkgo in Granada, Spain. "One species of tree that I would highly recommend for your consideration is the Ginkgo. Some of what I have to say later about ginkgoes might cause you to think otherwise, but bear with me! By the time you are finished reading this column, you may decide that this unique tree is perfect for your yard." * New topic: Ancient Ginkgoes, Redwoods and other plants threatened in China. Residents of Everett, Bedford County, PA, are rallying around the town's 140-year-old Ginkgo tree, which has buckled the sidewalk. A group is working to raise $15,000 to reinforce the tree, redo the sidewalk and spruce up the area. Read more here and here. 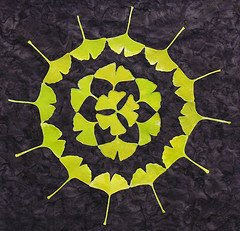 * Added photo AIPAD Photography Show 2008: sunburst of fallen yellow Ginkgo leaves on green grass. 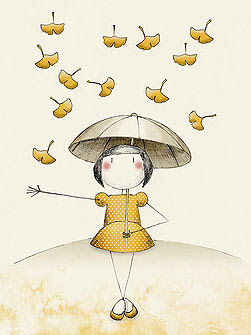 A lovely picture of a girl walking in a shower of Ginkgo leaves (by Etringita). * Added photos by Sam Cao and Atsuko & Kunihiko Kato of Ginkgo trees in China and Japan.